Kyle Gammon accounted for all three runs and went one-and-two-thirds innings to pick up a save against the Ohio Force 16U on Friday afternoon. 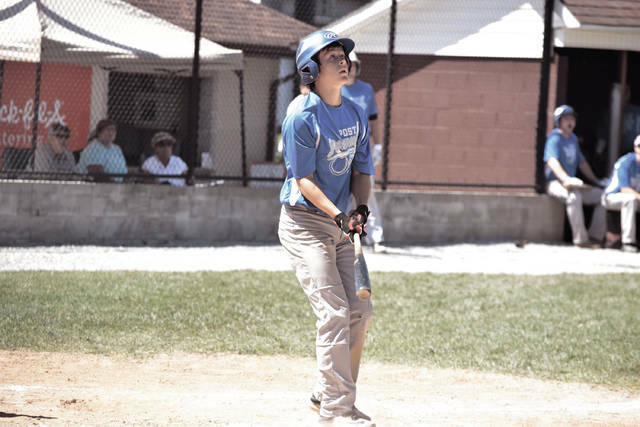 The Greenup County standout drove in nine runs during GBBC pool play. Brayden Davis watches a ball as it sails toward foul territory on Friday. Tyler Speas comes around with his swing on Friday. RUSSELL, Ky. — Since making his first plate appearance in the fourth inning of a contest between the Diamond Prospects’ 15U unit on Thursday morning at Raceland (Ky.) High School, Kyle Gammon hasn’t looked back with Post 23. In his very first at-bat, Gammon drove in Jesse Jones with an RBI single back up the middle. 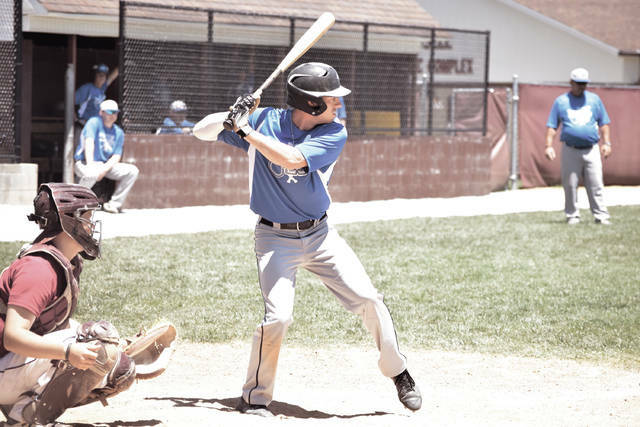 The recent Greenup County graduate and Shawnee State University signee then produced a home run, a sacrifice fly, four RBI, stolen base, two runs scored in a 10-4 victory over the Huntington Hounds’ 16U program later on Thursday. Two more RBI off of a double and a sacrifice fly, along with a stolen base, followed in a 14-2 thrashing of Russell early on Friday afternoon. However, Gammon’s performance against the Ohio Force 16U program may have been his best in his very short span to start play with Post 23. How about driving in another run with a sacrifice fly to start, launching a third-inning double to produce a second run in his second at-bat, and, after reaching via a two-out single, working the defense by stealing two bases and forcing a high throw en route to producing all three of his unit’s runs? Oh, and in addition to all of that, why not add a one-and-two-thirds of an inning save on for good measure? Yes, that’s what Kyle Gammon did — and it was arguably the difference in a win or a loss as Post 23 continued its strong play at the Gene Bennett Baseball Classic by winning a tight 3-2 decision over the Force in Portsmouth’s fourth and final game in pool play at the GBBC — which put Post 23’s record at 4-0 at the conclusion of pool play. From the outset, Gammon was on his game once again, and was able to add to his ever-growing RBI total thanks to a top of the order that continued to produce. Two defensive miscues allowed the 16U Force to obtain a 1-0 lead, but an infield single by Brayden Davis, along with a single to right field by Cole Dyer on a well-executed hit and run call, allowed Gammon to sacrifice Davis in with his well hit ball to the outfield as the production of each of the three individuals, along with leadoff hitter Tanner Kimbler, continued to be omnipresent as Post 23 knotted the game up at a run apiece. In the third frame, the top of the order struck again. When Kimbler was hit by a pitch, the Green standout stole second base, and Davis drew a walk, as well. Gammon then followed two batters later with a one-out double that landed near the center field track as Kimbler sprinted on home while Davis motored to third base on the hit. A pair of strikeouts by Luke Lashutka got the 16U Force out of a bases loaded jam following a Tyler Speas walk, but Portsmouth had taken a 2-1 advantage after three innings of play. 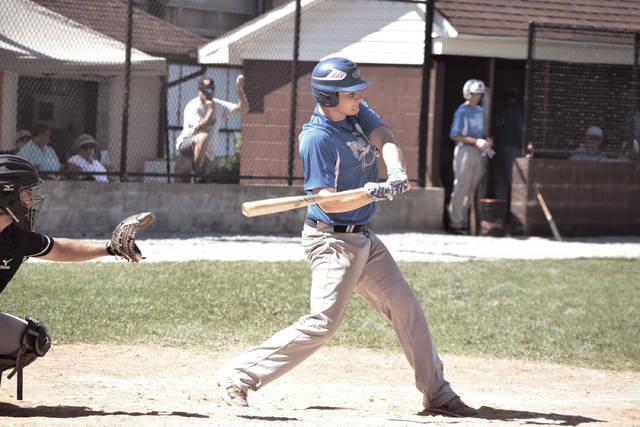 However, the strikeouts by Lashutka gave the Brook Park, Ohio-based travel ball club a noticeable boost. That was proven in the bottom of the fourth frame, when Connor Mays led off the frame with a single to left, then motored around to third base after an outfield error allowed the utility player to motor around. Nick Mercuri’s 4-3 groundout followed the error, which allowed Mays to score to knot the affair up at two apiece. After Davis led off the top of the fifth inning with a single, however, Post 23 looked to be primed for a big inning once again. A well turned 5-4-3 double play prevented that, but Gammon followed by taking matters into his own hands. With two gone in the inning, the future Bear singled back up the middle of the diamond, then stole second base cleanly after obtaining an excellent jump. Gammon then obtained a similarly excellent jump, and as he slid into third safely, forced Mercuri to rush the throw to third base, which resulted in an error as the ball sailed to right field. Gammon got up after the slide, sprinted on home in short order, and gave Post 23 a huge jolt as Portsmouth took the lead back, 3-2, after five innings of play. As Gammon rallied the troops offensively, Jared Morrow dovetailed Gammon’s efforts with a strong appearance on the mound. The senior-to-be and Valley product didn’t allow an earned run over five-and-a-third innings of work and stranded six 16U Force players on base during the contest to put Post 23 in a strong position. It certainly helped that Morrow, along with first game starter Reid Shultz, had the braintrust of Seth Nichols and Jarrett Stamper behind the plate, respectively. The cool, calm, and collected catchers caught all seven innings of both frames to help set the tone for Post 23 from a pitching and defensive standpoint — an impressive feat considering the heat, which reached the 90s on both Thursday and Friday. When Morrow allowed a base hit and a walk with one down in the sixth, Miller made the move to go with Gammon on the hill, which clearly paid off as Joey Lance’s flyout to right field and Jack Atkins’ strikeout proved. The 16U Force, however, didn’t go down without a fight. After retiring Mercuri and Ricky Sammon in order, a passed ball on a strikeout allowed Nate Uhas to reach, and a single by Timmy Baird, along with a walk by Sean Springer, allowed the homestanding unit to load the bases with two down. But Gammon, who never seemed shaken on the mound, showed the poise that has been evident throughout a productive baseball career as the senior struck out five-hole hitter Danny Castenir looking to end the thrilling contest with a save — in addition to the offensive show that the middle infielder and cleanup hitter put on for the crowd in attendance. With the victory, Post 23 will obtain no lower than a No. 3 seed at the conclusion of Friday’s games and could have as high as the No. 1 overall seed when the Gene Bennett Baseball Classic Tournament starts on Saturday.